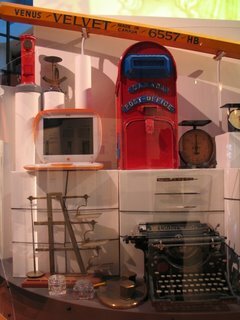 Random Scribbles: iBook in a Museum Already! In Canadian Museum of Civilization if you go to the Postal Museum, you will will find among other things an old typwriter (Underwood), weighing scales, pencils, etc. Those are things that one might expect to be there, but I was surprised to find that they have an Apple iBook there too! Yes, the Macbooks with Intel processors have replaced the iBook league but didn't they just come out a few years ago? Seemed interesting so I had to take a snap. The next time I happen to be there I will definitely take the picture of the HP palm top which they have already confined to the back alleys of the museum. Relegating the flashy iBook to the museum might give an indication that Postes Canada are very advanced and use the cutting edge technology. But are they?